Knitted codpieces, feathered mohawks and a collection dubbed Chic Rabbis – Jean Paul Gaultier didn’t earn the nickname enfant terrible for nothing. After nearly four decades in the industry, he’s dressed every icon and continues to playfully disturb gender stereotypes with his trailblazing designs. For this year’s annual Vogue Festival (in association with Harrods), which saw the industry’s biggest names descend on London for a series of talks and events, Gaultier sat down for a chat with the illustrious model and his long-time muse, Erin O’ Connor. Here are the top five nuggets of wisdom we learnt from the king of controversy. Prepare to have your collection of Beanie Babies feel significantly inadequate – little Gaultier had a teddy bear dressed in a homemade paper conical bra. But what’s childhood without a kooky grandparent? The designer’s grandmother still holds a special place in his heart, having served as an inspiration in his younger days. 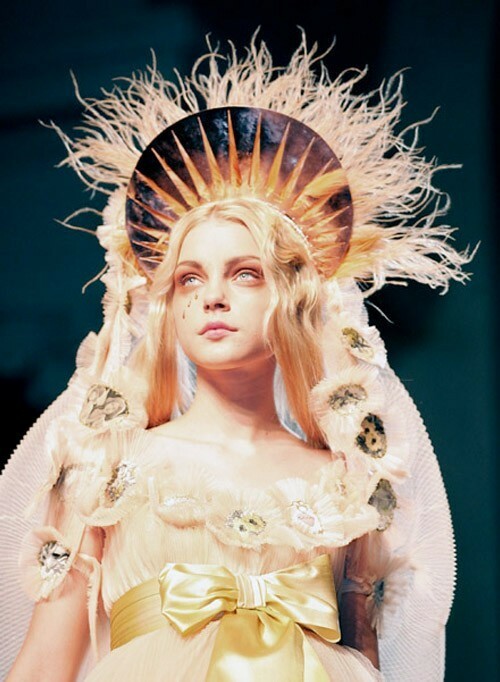 A precocious Gaultier would have a cheeky rifle in his grandma’s wardrobe, which is where he first saw one of his most coveted pieces – the corset. Fun fact: his nan used to drink vinegar before putting hers on in order to shrink her waist. From voguing with perfectly coiffed hair in the 90s to laying it on Drake this year at Coachella, Madonna’s always been a force to be reckoned with. When working with the Queen of Pop, the designer said there’s never any confusion over who’s “boss.” “She has a very clear vision,” Gaultier explained, having worked with Madonna on her Blonde Ambition tour and her “How to do That” music video. “She was saying the same thing with her shows and herself that I was saying with my clothes,” he continued, as both share a propensity to explore femininity in men and draw out the strength in women. It seems the native Frenchman has a bit of a soft spot for us Brits – commending our ability to “respect tradition but also destroy it.” But it’s the royal family he’s truly enamoured with. An unsuspecting audience member asked Gaultier: “If you could dress any personality, who would it be?” No-one was expecting him to say the Queen Mother. The radical designer also went on to explain his love of Queen Elizabeth II, referencing her infamous parachute stunt for the 2012 London Olympics opening ceremony. “I watched that and thought, I love England! Only you would do that!” The feeling’s mutual Gaultier.